Like clockwork closed sales are on the rise starting in August. 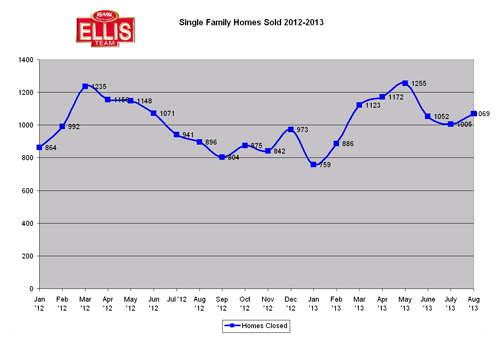 Last year we closed 896 single family home sales and in August 2013 we closed 1,069 for a 19.31% gain. This is especially interesting considering inventory levels are low. 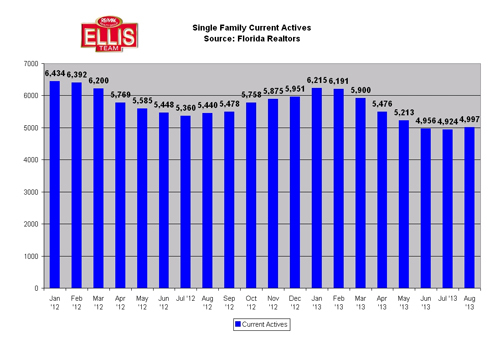 Closings on the Rise in SW Florida. Higher closed sales and lower inventory levels led to an increase in prices again. Median prices in August 2013 were $165,000 which was up 26.9% over last year’s $130,000 level, and average home prices were up 26.4%. We also like to look at month over month prices and median sale prices increased 1.23% from $163,000 in July to $165,000 in August. Average price gains were only .28% but a gain nonetheless. As we write this article the government is still shut down and it’s impossible to tell what effect this will have on the economy, financing of mortgages, both conventional and government mortgages, and closings in general. The consensus is that a prolonged shutdown will affect the economy as we’re taking hundreds of thousands of paychecks out of the economy. The larger affects could be to the confidence of the consumer, so suffice it to say Congress and the President should be talking instead of blaming each other. Should Washington get its act together we could be in for another good season. 2014 is shaping up to be a better year in many regards and the last thing we need is government getting in the way. Next week our MLS systems are supposed to merge. I’ve heard Oct 12 is the date and Oct 21. In any event, after the glitches are worked out, using the MLS and gathering data should be much easier for Realtors and consumers. Our website Topagent.com lets you search the entire MLS. Soon the data feeds should contain listings from Naples to Cape Coral. Sanibel and Captiva will be the only area not included in the new MLS although many of the listings end up in the common database anyway as island agents want the extra exposure. After the MLS merger there will be increased pressure on small MLS’s like Sanibel and Captiva to join. Typically Sanibel and Captiva have resisted as they’ve wanted the island to themselves and have tried to shut out Realtors from off the island, but in this day of technology that may be increasingly harder to do as buyers and sellers with multi-million dollar properties demand more from their agents. If Naples can join a common database so too can Sanibel and Captiva. If you’re a seller, now is the time to gear up your home sale for season. Give us a call at 239-489-4042 and find out how we sell our homes fast and for more money. We’ve got a marketing system that works and we’ll be happy to share with you how we do it. Posted in Cape Coral, Cape Coral Real Estate, Fort Myers, Fort Myers Real Estate, Southwest Florida Real Estate.Tagged Cape Coral Florida real estate market, Cape Coral MLS, Closings on the Rise in SW Florida, Fort Myers real estate market, government shutdown, Naples MLS merger, Sanibel and Captiva, Single family homes listing inventory SW Florida, SW Florida real estate market inventory.